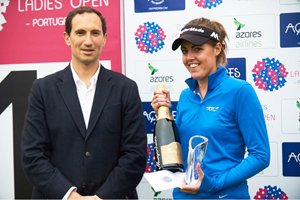 England’s Meghan MacLaren claimed her second victory on the LET Access Series with a two stroke win in the Azores Ladies Open, at Terceira Golf Club on Terceira Island. It is the second title for the daughter of David MacLaren – executive director of the European Seniors Tour – in LETAS tournaments, but the first as a professional, since last year, when she was victorious in Zaragoza, still as an amateur. It is indeed striking that MacLaren already has two LETAS titles in only four tournaments played. It looks predestined that she will enjoy a successful career, already having a card to play some events on the LET, and with her victory today seizing the number one ranking on the LETAS Order of Merit this season. MacLaren started the final round with a one-shot lead over Eva Gilly, which she would relinquish early on the final day. The young Frenchwoman covered the opening nine in 33 shots compared to MacLaren’s even par, 35. Both players struggled on the back nine in the windy conditions and reached the 15th hole tied for the lead. Gilly double-bogeyed the 16th, while MacLaren closed with bogey-birdie-par over the last three holes, for a round of 74. MELTHAM’S Jamie Bower is the new English men’s open amateur stroke play champion. Spectrum Wellness + Performance, Cross Lane, Fernwood Business Park, Newark, NG24 3NH.